Welcome! This is the first official post on my shiny new site and blog. If you've come over from my old site, glad to have you. If you see "part 4" and are a bit confused, you can go over to my old blog and check out part 1, part 2, and part 3 there. As the restaurant has opened and started full operation, we're in the mode of observing, correcting and refining. We have noticed the times and places that guests seem confused or the patterns of questions that the staff is receiving and are responding in ways that make the whole experience more seamless. For example, JJ's has a great rooftop deck and we realized that people that entered from the front, didn't know how to get access. 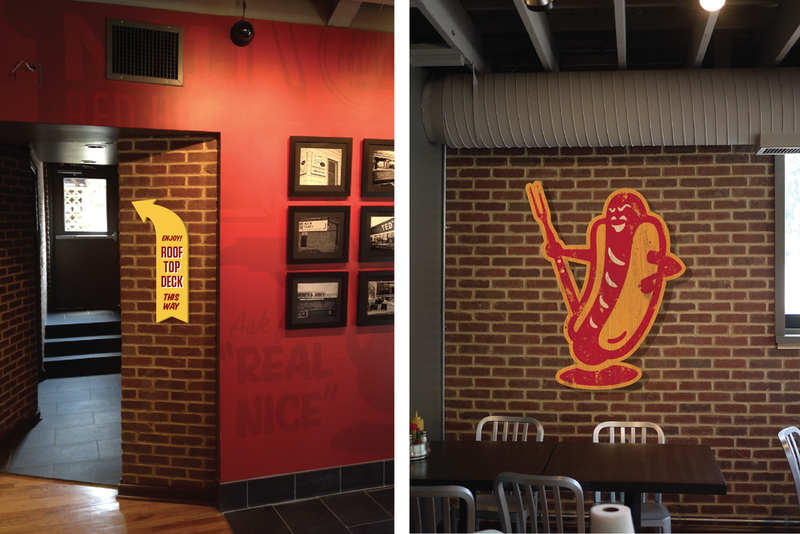 We also felt like we wanted more of the JJ's brand elements in the space. We decided to do some direct print to wood signage. I took photos and created really simple mock ups of my concepts and submitted these for approval. Once those were approved, I created production art at final size. I took the vector assets into Photoshop and did a lot of texture work, trying to keep in mind how these things would weather and wear over time and simulate this digitally. 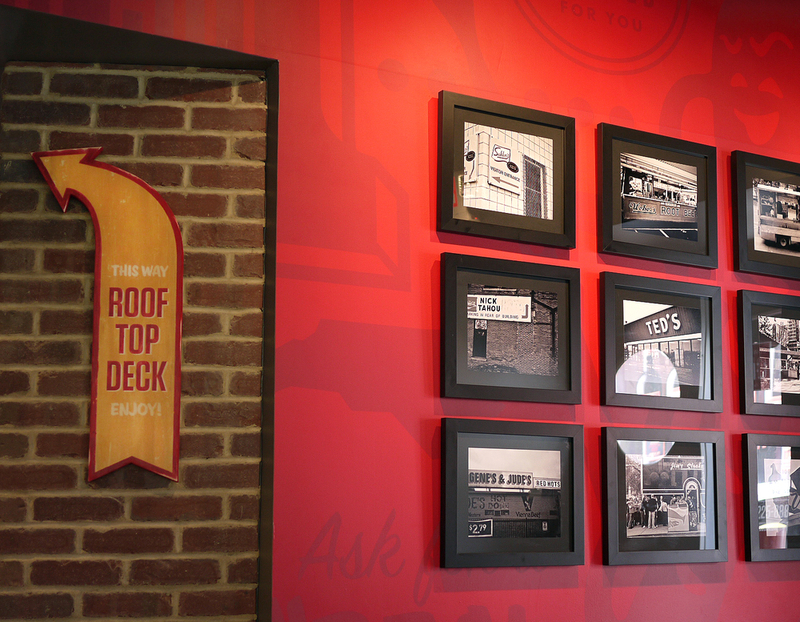 For our first round we were going to produce the Roof top sign and a large JJ mascot graphic. My hope was that between the texture in the file and what I could do with paint and sandpaper, we could come up with a cool effect, but honestly, wasn't sure what to expect. Sanding rough edges and weathering. With direct printing to wood, it is a conventional printing process, so we are not able to print white. I also felt like the digital prints were lacking depth. The ink prints very translucent, so the wood really shows through. On the arrow sign in particular, I wanted it to have some areas that were more opaque and where you could actually see brush strokes. After sanding the rough edges and adding some distressing, I painted the edges and went in with a brush, and went over the red areas on the face and hit the small areas of white. It was kind of like paint by numbers for amateur sign painters, but it got the effect I was after. I'm happy with this technique and we currently have some other signage in production. Another area that we are still developing is the point of sale and merch areas. The beer selection at JJ's grew quickly and the way of displaying what was available was not working. I was working from the restaurant that day, so I ran a few ideas by Brandy (JJ's event and programs director) and we had a good brainstorming session. Once we had something we liked, I again, did a super simple mock up. I think the comment I get most often is regarding what great client this must be. My answer is always a resounding "yes." As I think back there are a few things I can point directly to that has made this project and relationship work so well. I was brought in very early in the process. Almost from the very beginning, I was given access to how the brand was developing and became a part of that process. Early discussions that led to the initial concepts and all the foundational thinking started in October of 2011. What a huge privilege to be brought into an owner's vision so early. 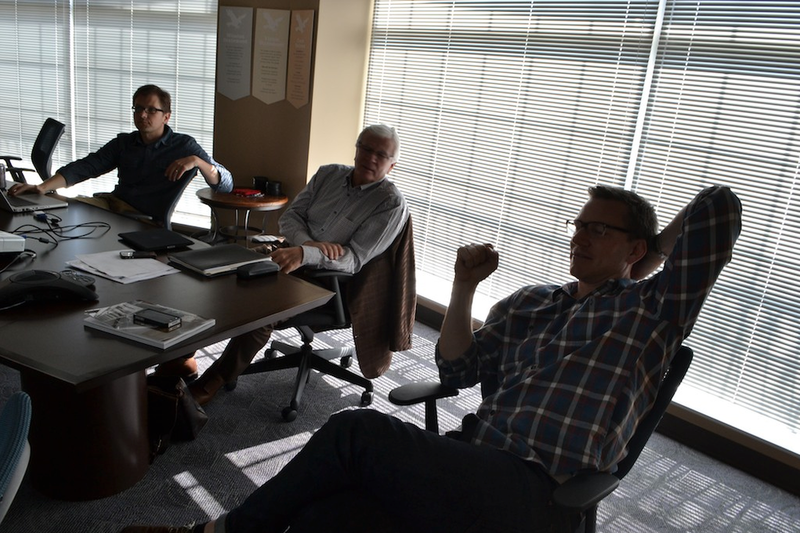 Jon Luther ( the creator and proprietor) and his core team come to the table with great ideas of their own. In particular, he and my client liaison, Brandy Newton embrace the collaborative process. Some of the best parts of this project have come directly from great ideas that they brought to the table. Many of them were simple things that inspired me to take them and run and in that process they changed a lot from the original vision. The idea to do logos for the individual dogs was inspired by the wonderful names that Jon came up with. This then led to Brandy's idea to do buttons which in turn led to the particular execution of the rewards program. This part of the brand has become a really important layer of the experience. The creative thinking has it's own momentum and as you look back, it's hard to even remember who came up with what and how it all began. To be given a great idea that you are allowed to use as inspiration and a starting point is a great gift to any designer. Other ideas were great things that I wasn't involved in at all. The drum light fixture was completely Jon's brainchild and adds such a great element in the space. The other huge factor is the element of trust. I have been included an invited in as an important part of the brand and of the process of defining what the experience of JJ's is. I am treated as a vital part of the team and my opinion is respected and my ideas are valued. I "get" the brand because I have been entrusted and equipped to get it. We're all pulling the cart in the same direction. This may seem like a strange time and place to talk about self-initiated work, but that's how I want to wrap this up. I've heard plenty of thoughts, both for and against lately. Without a real client to please and to provide parameters to work within, are we truly designing or providing a real solution to a real problem? Personally, these self-directed, client-less projects have provided almost every opportunity I've had over the last few years, including this one. This project was a result of doing a completely self-initiated rebrand of Dunkin Donuts, that made sense to almost no one at the time, including me. That in some strange ways, led to the work I did for Varsity Donuts and those two projects combined were a big part of being selected to do the JJ's work. Find a way to do the kind of work you love, make it great and show it to people. There are no guarantees, but you also never know who will see it and what it will lead to. Thanks so much for following along. I've really enjoyed looking back and gathering my thoughts. It' s been a great project and thanks to all who have had so many nice things to say about it. If you're in Charlotte or get an opportunity to come to JJ's, please come support it. Oh, and make sure to get the house made ranch with your onion rings...you'll thank me later.